The beautifully scenic Rend Lake Recreation Area in southern Illinois offers many outdoor activities, including golf, fishing, and bird hunting. 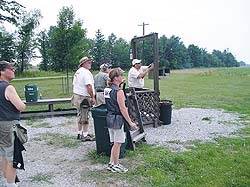 But the reason more than 250 shooters were there for three days in the middle of July was to compete in the 2005 Illinois State Sporting Clays Championship. The Rend Lake Shooting Complex sits on more than 400 wooded acres, with a 15-station sporting clays course originally designed by Marty Fischer. Dennis Sneed, general manager, and Bill McGuire, main target setter, set out to give the Illinois shooters an event to remember. With preliminary, 5-Stand, pump-gun, side-by-side, small-gauge, and 200-bird main events, nobody left feeling shortchanged. The full shoot report can be found in the October 2005 issue of Sporting Clays. Today, it’s not hard to find a quality choke tube for your shotgun. The tough part is deciding just which top-performing screw-in to go with. The value of sporting clays in making you a more proficient wingshooter this fall is all in how you bust your clays before this hunting season. Gregg Wolf reigned victorious in a challenging shoot that saw course designer Neil Chadwick set parcours that lived up to FITASC’s reputation for tough targets. Southern England hosted a super-challenging shoot, where Richard Faulds garnered individual gold and Great Britain snagged medals of the same luster in all team events. Cherokee Rose, newly transformed into a truly world-class sporting facility, hosted a top-notch shoot. Next time you’re near Atlanta, take time for a visit you’ll long remember. Rend Lake Shooting Complex filled shooters? days with a multitude of clays-breaking opportunities as hot as the Midwest?s scorching temps this July. Tough targets under clear Kansas skies challenged competitors to the max at this pair of shoots. For the first time ever, the NSCA gathered Junior and Sub-Junior shooters in San Antonio for a summer shoot-out to determine top guns among the shotgunners who are our sport’s future.